Growel’s 1O1 mall offers a comprehensive shopping, leisure and entertainment experience. It predominantly captures the Italian artistic characteristics; playing host to the choicest lifestyle offerings of many local and international brands. The interior of the mall replicates the ‘Roman Forum’ concept of connected plazas and retail streets that serve as a watering hole for shopping, dining, entertainment, and socialising; all exquisitely designed to transform space, and adapt to seamless possibilities. The retail streets have an integral and natural circulation through a variety of ‘Plazas’ that provide a unique journey that is both passage and experience. The Plaza’s ‘Ozone’, ‘Colosseum’ and ‘Mysteria’ display an exclusive architectural grandeur, with bold features to provide a distinct dimension of traditional and contemporary forms. Located in Kandivali, one of the fastest growing north-western suburbs of Mumbai, this mall is accessible from the Western Express Highway and Akurli Road and Kandivali Station which is a minute’s walk from the complex. SV Road, the spine of Mumbai is just a 10-minute walk away. It has close proximity to the domestic and international airport (10 kms) as well. 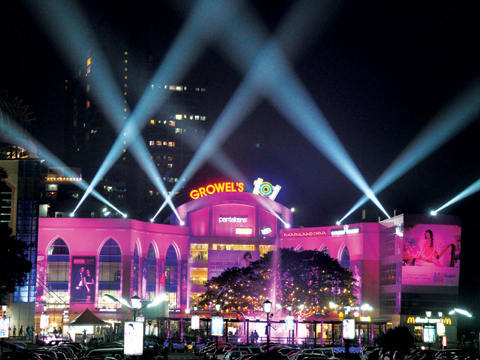 Growel’s 101 Mall – Phase I was launched in May 2005 with the opening of Big Bazaar. This was followed by the opening of the 4 -Screen Multiplex – Cinemax in January 2006. The two reputed giants occupied over 100,000 sq ft and have become anchors and partners in the first phase of this mixed-use development. The Phase II (300,000 sq ft) had a grand launch in August 2010 with Pantaloons as Anchor and 60 Vanilla stores like Reliance Trends, UCB , AND, Global Desi, Jashn, Esbeda, Nike & Puma. The mall has 79 per cent occupancy of local brands and 21 per cent of international brands. Among these, hypermarket, food & beverages, entertainment and footwear segments are performing well. Keeping pace with this new trend of retailing, the mall has come up with competitive strategies to win over online customers who will get more benefits only after visiting the mall. The mall official confirmed that they have been able to achieve their sales target with such strategies. Footfalls have improved drastically with the designed loyalty programmes and simultaneously they have also launched presence on digital medium ensuring an engagement activity with the customers..
Average rent: Rs 120 on carpet area.